There is evidence that MicroRNAs (miRNAs) regulate disease progression in rheumatoid arthritis. At the same time, recent studies suggest that in diseases such as rheumatoid arthritis and cancer there is a reduction in miRNA expression. In this new study, the research team will attempt to identify the mechanisms that underlie altered miRNA production in rheumatoid arthritis. In addition, they will use rodent models to determine the potential value of miRNA replacement therapy in treating rheumatoid arthritis. The researchers will specifically look at a family of miRNAs known as miR-17, as recent studies have provided evidence that miR-17 expression was significantly low in serum and joint cells and tissues of rheumatoid arthritis patients, as well as rats with a similar condition. This is new funding for the WSU Child and Family Research Unit (CAFRU) to implement the CLEAR (Collaborative Learning for Educational Achievement and Resilience) trauma-informed school response model in the Compton Unified School District in California. The intellectual property of CAFRU, CLEAR is a whole-school, trauma-informed systems change model, conducted in on-site consultation and professional development to partnering schools/school districts. CLEAR is implemented by a CAFRU staff member assigned as the CLEAR consultant in specific schools, partnering with school staff typically over a three-year period. This award provides funding for the establishment of a Native Alzheimer’s Disease-Related Resource Center in Minority Aging Research based at WSU, in collaboration with the University of Colorado Denver and Stanford University. The new center will serve to better understand and mitigate Alzheimer’s disease-related health disparities in American Indians, Alaska Natives, Native Hawaiians, and Pacific Islanders by building infrastructure, bringing together resources, and recruiting and mentoring promising junior- and mid-level scientists from underrepresented minority groups to conduct Alzheimer’s disease research in Native populations. This quality improvement project at Providence Visiting Nurses Association will focus on optimizing medications by improving the identification and communication of medication-related problems in vulnerable older adults who receive home health care. The improvement team will also participate in a shared learning and action network that will rapidly test various changes to create patient-centered approaches to optimize medications via the medication management process, the primary care team, and the development of a culture of safety. This award funds a natural history study of patients with succinic semialdehyde dehydrogenase (SSADH) deficiency, a rare inherited disorder that inhibits the breakdown of a neurotransmitter known as gamma-aminobutyric acid (GABA) and is associated with developmental delays and neurological problems. The study will follow 55 patients at Boston Children’s hospital and other sites around the world over the period of five years. Through yearly assessments of the patients, the researchers will determine the natural course of the clinical presentation of SSADH deficiency, using a novel clinical severity score to quantify the most prominent clinical features of the disease. They will also determine the natural evolution of known neurophysiological and biochemical abnormalities in SSADH—such as those related to brain volume, brain GABA concentration, brain myelination, cortical GABAergic function, and blood and urine levels of GABA and related metabolites. Finally, they will try to identify neurophysiological and biochemical predictors of clinical severity. The study will provide the information needed to better predict the natural course of SSADH deficiency and monitor the success of future therapeutics, as well as lay the foundation for the addition of SSADH deficiency screening to existing newborn screening panels. This award funds natural product-drug interaction studies involving two natural products: cannabinoids—a group of compounds that include tetrahydrocannabinol and cannabidiol—and kratom, made from the leaves of a tropical opioid-producing tree. These natural products represent two of four high priority natural products studied within the Center of Excellence for Natural Product Drug Interaction Research based at WSU. The research team has previously studied green tea and goldenseal. Together, these studies will enable the development of a set of recommended approaches for natural product-drug interaction research. This will lead to improved design of future natural product-drug interaction research and, ultimately, improved decisions on the optimal management of clinically relevant natural product-drug interactions. This project involves the adaptation of the revised version of a tool intended to measure self-confidence in identifying and reducing household environmental risks among Spanish-speaking populations. The original Self-Efficacy in Environmental Risk Reduction (SEERR) survey instrument contained 29 questions. After reorganizing the instrument around actions and behaviors taken in response to general household risks—rather than specific risks, such as mold exposure—the revised instrument (r-SEERR) has 11 questions. As part of the project, nursing students will test the adaptation by administering the instrument, along with a demographic questionnaire, to 125 adult Spanish speakers sampled from participants of the Special Supplemental Nutrition Program for Women and Children (WIC) program in Yakima, Wash. This award funds the development of a new interprofessional curriculum on chronic pain management and opioid addiction appropriate for use with students in a variety of health professions programs, such as nursing, pharmacy, medicine, and social work. An interdisciplinary faculty team led by Barb Richardson will design the two-hour interactive curriculum, which will include case studies that can be used with standardized patients or online with video scenarios. Standardized patients will be hired and trained to portray the patients with chronic pain and potential opioid addiction described in the case studies. This new study will evaluate the antiseizure properties of farnesol and similar chemical compounds in a mouse model of succinic semialdehyde dehydrogenase (SSADH) deficiency. SSADH deficiency is a rare inherited disorder that is caused by mutations in the ALDH5A1 gene. It is associated with significant developmental delay and extensive neurological problems that include seizures, which increase with age. Farnesol has been used to suppress and prevent alcohol withdrawal seizures. Preliminary work by the research team recently showed that farnesol suppresses seizures in experimental SSADH deficiency. The goal of this project is to characterize the anti-seizure properties of farnesol with an evaluation of different doses and long-term efficacy, as well as to begin to identify the structural determinants of farnesol that are critical to its antiseizure activity. The study will bridge gaps in the development of targeted therapies for SSADH deficiency while providing insight on the use of farnesol and similar compounds in the treatment of other forms of epilepsy. Homeland Response Forces National Guard personnel are at increased risk for exertional heat injury, since missions and disaster preparedness exercises have them performing exertional tasks while wearing chemical exposure suits under extreme environmental conditions. The goal of this study is to expand the SF-600—a currently used health assessment form used to determine service members’ deployability—into an evidence-based tool that includes a measure of immediate exertional heat injury and a score indicating the risk of exertional heat injury if that service member is deployed. The revised SF-600 will also include evidence-based practice guidelines for immediate treatment by medics and for management of future exertional heat injury risk for service members who don personal protective equipment multiple times. The researchers’ long-term goal is to reduce the prevalence of exertional heat injury among service members through clinical screening for exertional heat injury risk and early detection of vulnerability to exertional heat injury. This grant funds the analysis of data related to vascular brain injury and cognitive impairment in American Indians. The data is being collected as part of a follow-up study to the Cerebrovascular Disease and its Consequences in American Indians study, which examined 1,000 American Indians aged 64 to 95 years from 2010 to 2013. Participants from that study received clinical examinations, neuropsychological testing, and brain MRIs. A follow-up study was started in 2016 to re-examine surviving participants according to the same protocols, with the addition of assessments for probable Alzheimer’s disease. As part of this newly funded project, the research team will quantify and evaluate associations for incident vascular brain injury, neurodegeneration, and changes in cognitive status in this elderly minority population identified in the data. The grant also allows the principal investigator to complete career development activities that will position her as an independent investigator and leader in innovative neuroepidemiology research with minority populations. This is a subcontract of an NIH grant awarded to UC Davis for a longitudinal study on the changing sleep need in adolescents. Van Dongen and his colleagues will assist in analyzing and interpreting daytime performance data. Sleep issues are common in post-traumatic stress disorder. Up to 91 percent of PTSD patients experience difficulty falling asleep and staying asleep, and this poor sleep has been linked to exaggeration of PTSD symptoms. Using a rodent model, this study will set out to determine the interaction of sleep in the acquisition and maintenance of PTSD. The goal is to determine the impact of pre-trauma sleep on long-term outcomes of post-traumatic stress disorder (PTSD) and to evaluate whether sleep improvements after trauma exposure can mitigate the development of cognitive impairments in PTSD. Affecting 1 in 8 men, prostate cancer is the most common non-skin cancer in the U.S. Scientists are looking at the microenvironment around prostate cancer cells to find ways to prevent and treat this form of cancer. 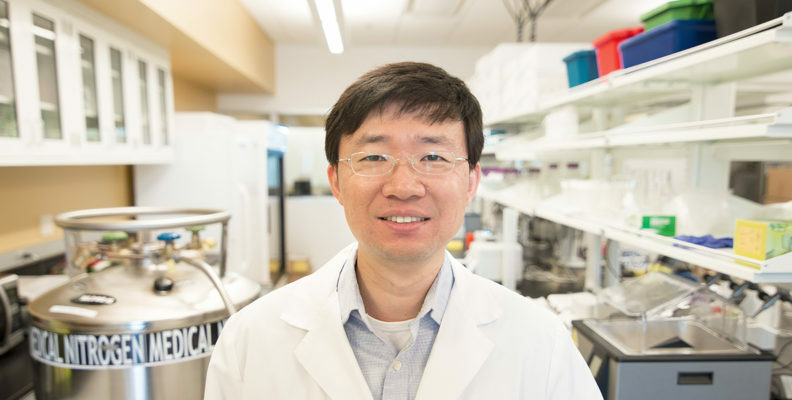 This study will look specifically at the stromal cells that connect tissue cells in the prostate as a potential target for anti-cancer therapy. Previous research by the principal investigator has shown increased expression of a protein known as monoamine oxidase A (MAOA) in prostate cancer stromal tissue as compared to healthy patient tissue. He also found that MAOA in stromal tissue promoted prostate cancer growth, whereas genetic manipulation to disrupt the production of MAOA reduced or eliminated prostate cancer growth in mice. This study will take a closer look at the role of MAOA in reprogramming prostate cancer stromal cells and will explore the potential value of targeting MAOA in prostrate stromal cells as a way to treat prostate cancer. This is a subaward of a project led by the Pennsylvania State University to examine the regulation of telomere length during the development of acral lentiginous melanoma, a type of skin cancer that is most commonly diagnosed in people of Asian and African descent. Telomeres are the protective ends of chromosomes. Telomerase is the protein that lengthens telomeres, which keeps cells from dying. This study will specifically look at mutations of the telomerase gene (TERT or, in humans, hTERT), which are more common in acral lentiginous melanoma as compared to cutaneous melanoma, the most aggressive form of melanoma. The researchers will test the hypothesis that telomere-induced chromosomal instability promotes the activation of hTERT and the progression of acral lentiginous melanoma. The project will help develop unique models to study the role of the TERT gene in melanoma development and develop new approaches to control these diseases. The College of Nursing previously received matching funds for PhD in Nursing candidate Amy Thomas to participate in the Jonas Nurse Scholar program in Chronic Health. This award funds an additional matched scholarship for Tara Marko, who will be taking part in the Jonas Nurse Scholar Program in Environmental Health. The program supports doctoral nursing students and aims to increase the number of doctorally prepared faculty available to teach in nursing schools nationwide and the number of advanced practice nurses providing direct patient care. This award provides renewal funding for the implementation of Collaborative Learning for Educational Achievement and Resilience (CLEAR) trauma-informed school response model at Lincoln Elementary and the Gladiola Campus in the Grants Pass School District in southwestern Oregon. Developed by the WSU Child and Family Research Unit (CAFRU), CLEAR is a whole-school change model that helps educators and other school professionals recognize, understand, and deal with the effects of children’s exposure to harmful experiences, such as abuse, neglect, homelessness, and domestic violence. Implementation of CLEAR will be done through on-site monthly consultation and professional development trainings provided by CAFRU staff over a three-year period. This is renewal funding for the WSU Child and Family Research Unit to assist with the implementation of the CLEAR (Collaborative Learning for Educational Achievement and Resilience) trauma-informed school response model in three elementary schools in the Juneau School District in Alaska. CLEAR is the intellectual property of CAFRU. This is renewal funding for the WSU Child and Family Research Unit (CAFRU) to implement the CLEAR (Collaborative Learning for Educational Achievement and Resilience) trauma-informed school response model at Sunnyside Elementary School in the Pullman School District. CLEAR is the intellectual property of CAFRU. This grant funds the continuation of a project to adapt an existing diet intervention designed to reduce high blood pressure for use in Native populations and disseminate it to health professionals, with the goal of reducing Native patients’ health risks related to high blood pressure. Partners in this project include the Fred Hutchinson Cancer Research Center’s Division of Public Health Sciences, the University of Oklahoma Health Sciences Center, the Indian Health Resource Center of Tulsa, Native Health of Spokane, and the MedStar Health Research Institute Laboratory. This is supplemental funding for a discovery center that facilitates the study of underlying causes of urologic chronic pelvic pain syndromes. The center collaborates in the Multi-Disciplinary Approach to the Study of Chronic Pelvic Pain (MAPP) Research Network and its goal is to conduct multidisciplinary, multi-site, basic, translational, and clinical research on urologic chronic pelvic pain syndromes. The additional funds supplied by this award support targeted data analyses that use epigenetics to identify novel pelvic pain subtypes and urological symptom subtypes. This award funds the continued operation of an Economic Development Administration (EDA) University Center at WSU. Based in Spokane, the WSU University Center for Innovation makes available university resources to the public to promote economic development in Washington State, North Idaho, and northern Oregon. It cultivates innovation and supports commercialization by providing technical assistance to small businesses and startups; conducting applied research on the market viability of products and services that drive small businesses; and assisting distressed areas within its region by identifying areas of potential economic development and helping to develop that potential into sustainable jobs. Under this new grant, the University Center for Innovation will work with other organizations in the region—such as the WSU Vancouver Business Growth Mentored Activity Program—to provide services to help new businesses form and create new jobs. These are continuing funds for a two-year study examining the role of neurotrophins in the regulation of sleep. Neurotrophins are a family of proteins that regulate the survival, development, and function of neurons, or nerve cells. It has been hypothesized that they play a central role in sleep regulation: brain neurotrophin mRNA and protein levels increase with wakefulness, and administration of neurotrophins increases sleep time and intensity. Neurotrophins also govern cellular processes linked to sleep function, including brain cell survival and synaptic plasticity. However, the precise role of neurotrophins remains unclear. The study will use a mouse model to determine the role of three neurotrophin-TrK receptors on the sleep-wake balance and on genome-wide changes in the brain that accompany the accumulation and discharge of sleep need. This grant provides renewal funding for WSU researchers to create an online training for law enforcement officers related to the health and safety risks of shift work and long hours. As part of this project, the researchers will review an existing online training program for nurses and make recommendations for tailoring its content for law enforcement; produce audio/video segments and photographic images to incorporate into the program; provide narration for selected parts of the program; and conduct two focus groups in California to solicit feedback from law enforcement on the draft training content. This award continues funding for a fellowship program that complements and extends the work of the Collaborative on Health Reform and Independent Living (CHRIL), a multisite Disability and Rehabilitation Research Project funded by the National Institute on Disability, Independent Living and Rehabilitation Research. The program will fund three postdoctoral research positions for individuals with disabilities who are personally committed to understanding and improving health policies and services for disabled Americans. The goal is to have these students go on to faculty positions at major universities or leadership roles in federal research agencies and nonprofit foundations. This award provides continued funds for a five-year project to determine whether modifications to an intervention known as contingency management—which uses incentives to reward positive behavior—can improve outcomes and reduce costs in heavy drinkers with serious mental illness. Using ethyl glucuronide (EtG) urinalysis to measure abstinence, a previously conducted randomized 12-week contingency management trial found that contingency management participants were three times more likely to test negative for alcohol than controls and also found lower levels of heavy drinking, stimulant drug use, and cigarette smoking. However, contingency management was ineffective for participants with an average pre-treatment EtG level that indicated frequent, recent heavy drinking. This study will investigate whether outcomes can be improved by increasing the value of incentives used in the intervention or by rewarding light drinking before rewarding abstinence. This award represents a diversity supplement for a five-year project to determine whether modifications to an intervention known as contingency management—which uses incentives to reward positive behavior—can improve outcomes and reduce costs in heavy drinkers with serious mental illness. The supplement provides funding to support two years of research- and career development and training for research assistant professor Oladunni Oluwoye. As part of her training plan, she will expand her knowledge of web development, with the goal of developing a prototype for a comprehensive web-based contingency management tool that includes an interactive training guide for clinicians. This grant provides renewal funding from the federal TRIO programs for the Upward Bound program. Upward Bound is designed to generate the skills and motivation necessary for success in education beyond high school among young people from low‐income families and families where neither parent has acquired a bachelor’s degree. Upward Bound provides program participants with fundamental support in their preparation for college entrance. This Upward Bound project housed at WSU Spokane focuses on three small high schools in Stevens County. This award provides supplemental funding for a study of the effectiveness of the Caring Contacts approach as a way of reducing suicidal ideation, suicide attempts, and suicide-related hospitalizations among Native American young adults. A recent study has found that suicide rates for Native American young adults in the Northern Plains and Alaska are much higher than those for white Americans in the same regions. The Caring Contacts approach uses text messages expressing care, concern, and interest to supplement standard suicide prevention. In a randomized, controlled trial, this study will compare the use of the Caring Contacts approach as a supplement to usual suicide prevention care versus usual care only in at-risk Native American young adults over a 12-month period. The administrative supplement funded by this award pays for the addition of an extra follow-up assessment 6 months after participants complete their intervention. This is fourth-year renewal funding for a five-year grant to establish a multidisciplinary Center of Excellence for Natural Product-Drug Interactions Research. Led by WSU in collaboration with four other institutions, the center will strive to create a roadmap for best research practices on how to study potential unwanted interactions between natural products and conventional medications. It comprises four cores: administrative, pharmacology, analytical, and informatics. The research team will work with the National Center for Complementary and Integrative Health (NCCIH) officials to identify a priority list of natural products that could affect the efficacy and safety of conventional medications by altering drug distribution and elimination in the body; identify challenges to studying these complex interactions; propose approaches to overcoming these challenges; develop a Web portal that will allow other researchers access to data for further analysis; and communicate the health implications of study findings to the public. This award continues funding for an NIH Mentored Research Scientist Development Award that provides the PI with funds to start a line of research on the role of sleep in Autism Spectrum Disorder (ASD), the most prevalent neurodevelopment disorder in the U.S. Sleep problems have been shown to occur at a much higher rate in ASD than in typical development. They predict the severity of core symptoms of ASD—such as repetitive behaviors and social/communication deficits—as well as associated problems, such as tantrums and aggression. This research will specifically look at the role of Shank3—a gene that has been associated with ASD. Deletion of the Shank3 gene leads to Phelan McDermid Syndrome, a rare disease that is often accompanied by ASD. This study will build on preliminary work that showed that mice with a mutated Shank3 gene slept less after they had been sleep deprived than mice that did not have the mutation. It will attempt to determine whether this is due to decreased sleepiness or difficulties falling asleep. The research would increase scientists’ understanding of the mechanism that underlies sleep disturbances in individuals with ASD and may eventually lead to new interventions that could improve quality of life for patients and their families. This is continued funding for a project to develop the Strong Men, Strong Communities program. The program provides a culturally appropriate approach to reducing the risk of diabetes in American Indian men, who experience type 2 diabetes at much higher rates than other racial and ethnic groups in the U.S. The investigators will study the effectiveness of the intervention in American Indian men in three different settings—a reservation in western New York; an urban health clinic in Minneapolis, Minnesota; and a Native community center in Portland, Oregon—as compared to waitlisted control groups.